The most beautiful thing about Copenhagen is the the bikes. Bikes, bikes everywhere. I HAD to have one after three days of walking and riding trains. Much to my delight, I discovered a free rental booth right there at the climate conference. 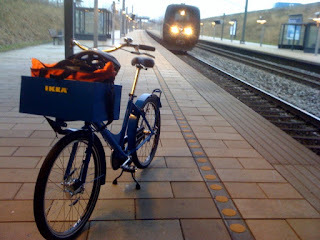 All 25 motor-bikes were rented, but I didn't care, I needed some exercise and completely emission-free action. 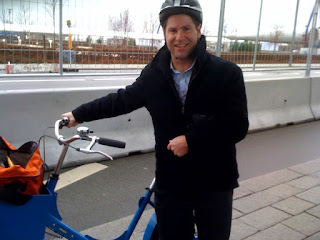 I was surprised that they only had 180 bicycles rented out. But the guy at the stand said many people didn't came from places where there is a bicycle culture and, plus, the weather IS pretty cold in Denmark in December. Never mind that, I soon had my IKEA-brand prototype, which supposedly isn't going to be anywhere on the market except in Denmark for the next three years. These particular 100-pound beasts will eventually be delivered by a Copenhagen non-profit, in partnership with the furniture seller, to African communities to be used as ambulances! I was on the road and lethal (this bike could do some damage). With the brisk air in my face, I set off from the central train station, past the famed Tivoli amusement park and gardens, then straight over a bridge where I promptly got lost for well over an hour. But much to my good fortune, I ended up in what I've heard was a 200,000-plus mass of anarchists, socialists, and other angry yet friendly-enough people marching straight towards the Bella Center (home of the conference) to protest ... something. The gist was that they wanted action on climate change, but that politicians are far too incompetent to be up to the task. Fair enough. The protesters were cool and all, but I was in love with the streets of Copenhagen (long "a" or short "a," take your pick). It's amazing; there are very few streets that don't have double-wide bike lanes. And cars and pedestrians seem to hold a strong bikes-first attitude. 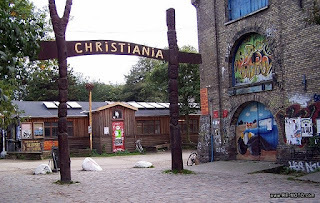 Next I headed down to Christiania, or "Freetown." It's a hippie commune that is blocked off from the rest of the bohemian side of Copenhagen by a wall covered completely in tasteful graffiti. Apparently it's a tourist hotspot, despite its occasional bouts of violent crime. But it seemed to me like everyone else was much more at home than me. It was eerily quiet as I walked through dark, tree-lined walkways; markets selling hippie clothes, trinkets, and pot-smoking devices; anarchist aid stations set up for the protesters; and fireworks being set off near a field of teepees. I got out of there without taking any really good pictures (which, I heard, is frowned upon, but it was dark at 3 p.m. when I was there anyway). I lifted this shot of the main entrance from the Web. Upon leaving Christiania, I passed a castle named Rosenborg Slot, wheeled my way around downtown, and headed back to work. But for one afternoon (and and hour or so the day before in Malmo, Sweden) I was in bike heaven, which is about as good as it gets.